Our customers span a wide range of sizes and industries from large international companies to small local businesses such as restaurants. A big reason for our success is our ability to 'fine tune' the way we do business to accommodate the specific needs of each customer. We work with you up-front to gain an understanding of your needs and then offer a program that makes sense for you - many times with no contract required. Depending on the size and complexity of your program, we can be up and running and ready to place orders in a few days. If you would like to speak with a sales representative to find out more about our capabilities, please feel free to contact us. While our in-stock product line is very extensive, certain clients require something a bit more custom. 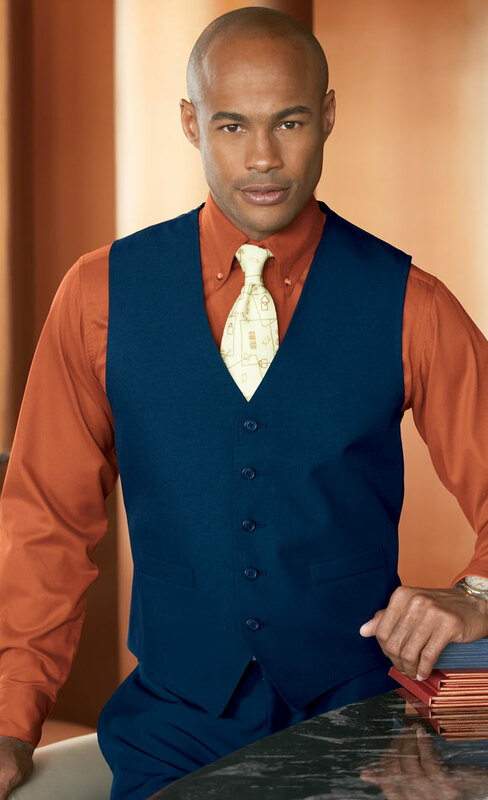 Many times - we can alter our stock garments by adding trims, stripes and other options to help you achieve the 'look' you want while avoiding the additional time, cost and commitment of custom designed & manufactured uniforms. If you do want a completely new design, we have the ability to handle your needs from the design phase through manufacturing and distribution. We offer a very extensive variety of options for customizing your garments including logo embroidery, custom trims, stripes and much more to create a unique look. Depending on your preference - we can customize items on as 'as needed' basis for you which takes 5-10 business days or we can stock customized items so they will ship within 24 hours. We offer customizable reporting that provides order and cost detail at virtually any level. For example, some customers require monthly reports showing order history sorted 'by employee' or 'by facility'. We retain all order information in our system and can meet virtually any reporting request. For many larger accounts with multiple locations, difficulties surrounding purchasing and distributing products to employees can be time consuming and costly - we can help. We can sort, bag and label orders by employee and drop ship to multiple locations or individuals to help make distribution a snap. We ship from several warehouses located throughout the U.S.A. to help get your products to you quickly. We can create a personalized catalog in pdf format for you that you can electronically distribute to your employees. The catalogs can include your logo and we can limit the products shown in the catalog to only those styles that are approved for your account. Sizing guides and 'how to measure' section is included for all items. Ordering can be done by phone, fax or email. If you prefer, we can create customized order forms for you to your specifications. Orders can be typed in email or sent as attachments in PDF, EXCEL or WORD formats. We have a variety of controls we can apply to your account to help avoid errors or unauthorized orders. For example, we can limit which products can be ordered by your organization, who is authorized to place orders and where the orders ship. If you require signatures on orders we can check for that and also prevent duplicate purchase order numbers from being processed. We can process orders from a centralized contact, by individual, department or location.